Birding on Thanksgiving morning is one of my favorite traditions; seems like there are always quality birds around. And if not, there's always great food and family later in the day. I started the day at 8am by walking Walnut Beach and Silver Sands in Milford, both of which were very quiet. Then on to Milford Point, where hunters in the marsh had flushed the dabbling ducks out to the Sound. While scanning through several dozen Black Ducks I picked up on a female KING EIDER that was loosely associating with the flocks. She was very settled into one general area straight off the back side of the "Piping Plover" sandspit, which was quite distant but close enough to provide the occasional decent scope view. After being slowed down by the eider at Milford Pt, I had to hurry through the Stratford area so I wasn't late for dinner. Highlights here were 3 Semipalmated Plovers behind the warehouses at the McKinney refuge, and an adult Northern Gannet that was flying around Bridgeport Harbor for whatever reason. That's a nice find along with a couple of good instructive images. 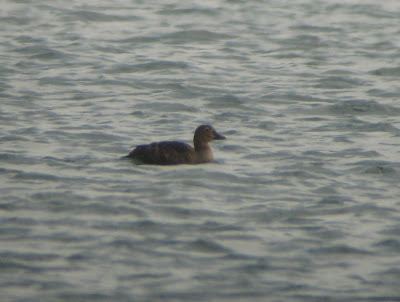 Just out of curiosity, how scarce is Common Eider along your stretch of the coast? 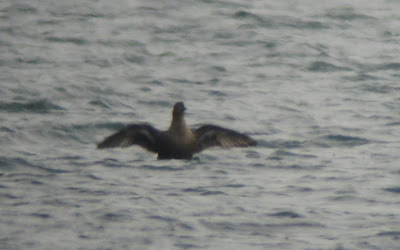 Common Eider is fairly rare away from farrrr eastern CT. Over the past few years Common Eiders have been breeding very close to the CT border (in, I believe, NY waters in far eastern LI sound). Some of these birds, and birds that winter along the RI shoreline, occasionally spill into CT waters in far eastern CT, especially during easterly blows.